I've always enjoyed reading about the laws of attraction and how our thoughts can bring us better health, happiness and even wealth and good luck. 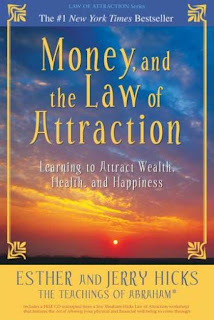 Esther ad Jerry Hicks have written a very interesting book on the subject, called: "Money, and the Law of Attraction." I found this book very interesting in what I have read so far, and continue to read though it, trying to apply some of what they say in the book, to my own way of thinking.This book is more like a guide to help you to be positive in your thinking to achieve more good health, happiness and wealth into your life. I personally think anyone would benefit and find this book very eye opening. Raincoast Books would love to give away a copy of one of these books to one lucky winner from Canada , in a random draw that will be held on March 30, 2011 by Random.org. Tell me why you'd like to win this book. My hubby and I are (still) paying off the wedding and I am just starting a business and need to work on attracting money (I am reluctant to charge for my services). This book would be very, very helpful! I love Jerry & Ester Hicks and I believe their information is valuable. I would love to win this book so I could read more about the law of attration and money. I am reading The Power right now, which is the second book from The Secret. Very interesting stuff. I believe in the Law of Attraction and think this would be a great book to read. This sounds like a great book. Would love to win as I think I would enjoy it. I have read a few of Jerry and Ester Hicks' books, and have enjoyed them all! Would love to own one of their truly inspirational and 'good advice' books! Thank you for this giveaway, it is really great to see an inspirational book as a giveaway! definitely a loyal subscriber to your emails, love your comments, advice, and giveaways! Thank you so much for all the time and effort you put into your blog, we really appreciate it in our quest to do our best, financially, emotionally, and in all ways!